Eric Henderson’s motorcycle is almost as interesting as his job. 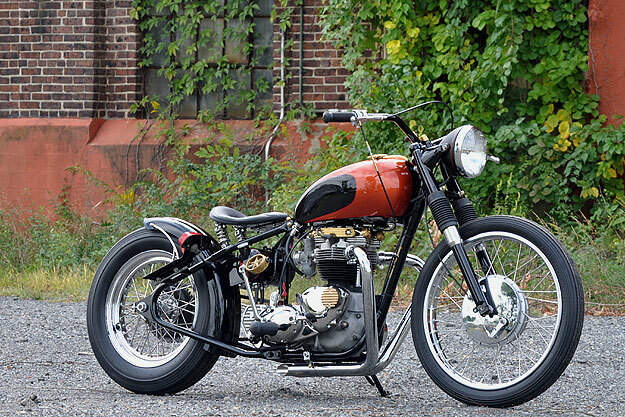 He’s an underwater welder in New York City, and when he’s not working below sea level, he’s riding a 1967 Triumph TR6R Tiger custom that took two years to build. Eric’s owned this single-carb bike since 1986, and he kept it stock until the motor died in 2007. 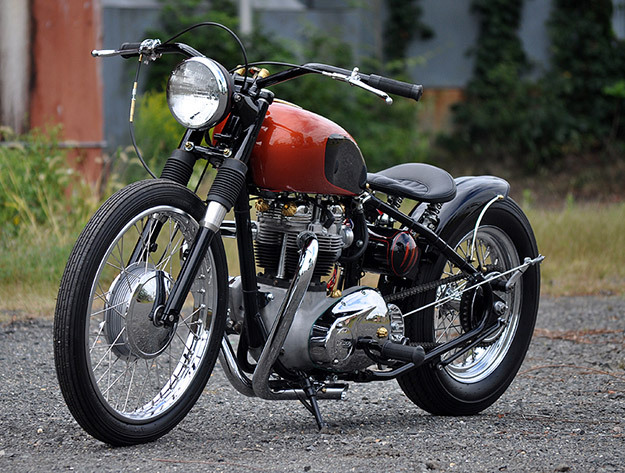 “I tore the bike down with the intention of restoring it,” he says, “but the custom bug bit me instead. So I got the motor rebuilt by the good folks at TT Cycles in Berkeley Heights, NJ. Steve Blaufeder did the total rebuild from the crank up.” Then Eric bought a bolt-on David Bird hardtail from Lowbrow Customs to revolutionize the look of the bike—it’s a 4-inch stretch with a 2½-inch drop. “I made all the brass parts on my CNC mill, such as the points cover, oil feed, rocker caps and handlebar risers. 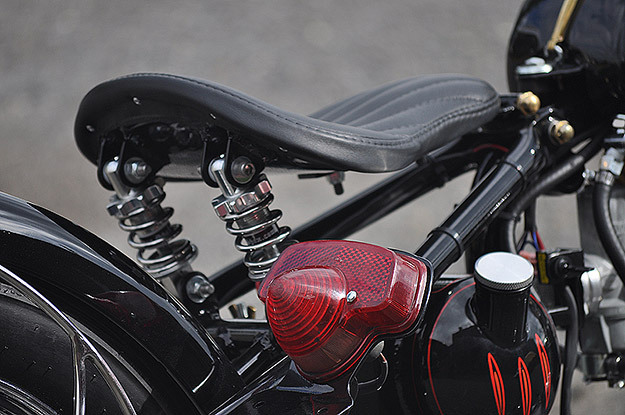 I also made the handlebars and designed the taillight bracket. Dennis Harrold at TT Cycles massaged the hardtail and made the stainless steel fender struts as well as the fender stays that blend in with the frame.” TT also powdercoated the frame and front end in a wet gloss black. 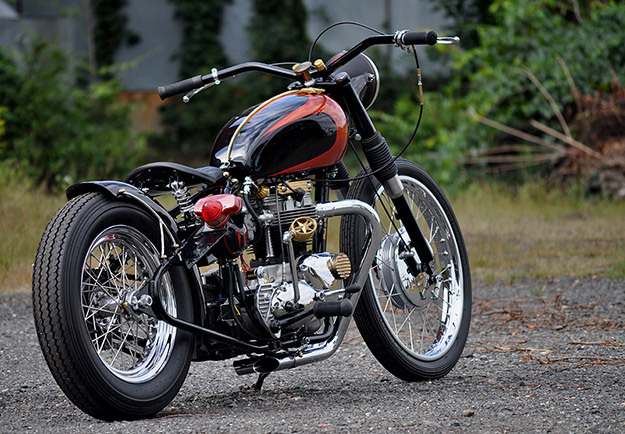 The front wheel is a 21-inch Avon Speedmaster laced to a stock 1967 front drum brake and chromed. 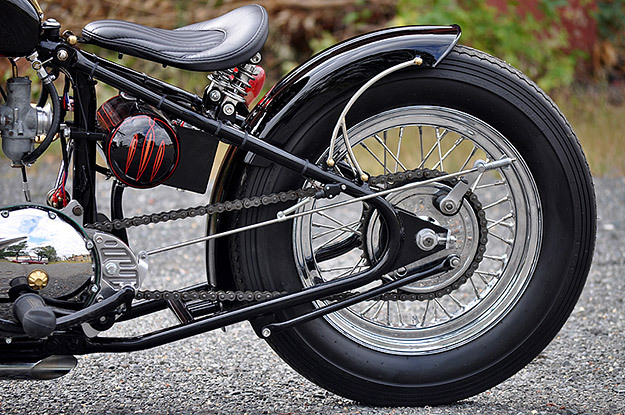 The rear wheel is a 16-inch Shinko, also laced to a stock 1967 Triumph hub. Aidan Originals made the seat, and it has Chopper Shox underneath for a smooth ride. “The gas tank is the original 1967 TR6R tank with the emblems removed and the parcel grid holes filled for a super clean look,” says Eric.